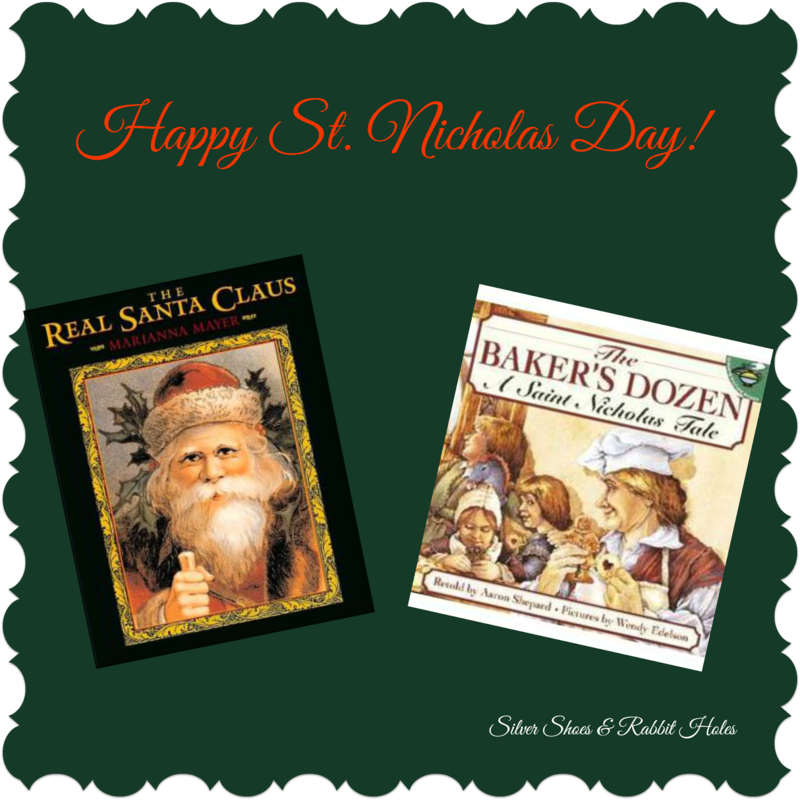 Silver Shoes & Rabbit Holes: Happy St. Nicholas Day! December 6th is St. Nicholas Day. We talk about St. Nicholas in our house, but we don't leave out shoes or anything. It isn't a tradition Mr. B or I grew up with. (My German grandma didn't grow up with it, either.) We love the story of the real St. Nicholas, though, and share that with the girls. Above are two books. The Real Santa Claus by Marianna Mayer is a very wordy picture book, illustrated by beautiful old paintings. We checked it out from the library, and it appears to be out of print. On a simpler scale is The Baker's Dozen: A Saint Nicholas Tale by Alan Shepard is a retelling of a Colonial American folktale that captures the spirit of the day. And there's a cookie recipe. Recipes in picture books are always a plus for me. For lots more St. Nicholas resources, check out the St. Nicholas Center website. 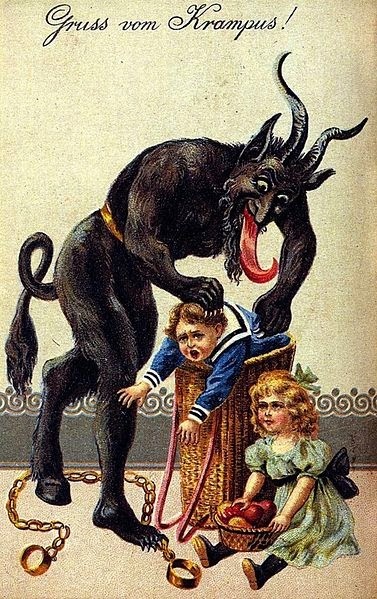 And because I get a kick out of the guy, um, Gruß vom Krampus. Tee hee hee. More seasonal goodness to come! Merry Weekend! Happy Reading! I have never heard of St Nicholas Day. And I actually OWN a Nicholas! (both the book and a son!) Its a German tradition? Have you ever read what David Sedaris wrote about the St Nicholas/ Santa's in different countries? Its a chapter in "Dress your Family in Corduroy and Denim" and its so funny. Anyway, thanks! Not just in Germany, but in other parts of Europe, too. It's the Feast Day of St. Nicholas, and children in those places (and in places of strong German heritage in the United States) leave their shoes out the night before, anticipating gifts. Oh my word!! My eyes can never un-see that creepy picture!!! LOL!!! I have friends on Facebook with album after album of Krampus pictures. They make me laugh. They're so wrong! I joke about him with the girls. They think I'm crazy. Goodness gracious! That Krampus creature scares the heck out of me! I bet you, parents told his story and showed his picture to kids back in the days to scare them and convince them to never ever get on the naughty list! Oh, yes, that was the point! And he is still talked about and dressed up as in some of Bavaria and Austria. I have a friend in Seattle with a German foreign exchange student, and she educated them about the Krampus this week. There are YouTube videos of people dressed as Krampus at modern parades and stuff. Makes the Elf on the Shelf look lame! Tee hee! What a creepy creature indeed! Happy St. Nicholas day and hope you have a great weekend! LOVE! Happy St. Nicholas day! The Real Santa Claus looks amazing. It's going be a high of 30 here this wkend. COLD for us! The art is gorgeous, but it's too dry and wordy for the girls. Interesting to skim for information, though. As of 3 AM (oh, s! @#, I need to go to bed! ), it's FIVE DEGREES! And my poor husband left for work only 30 minutes. I hope he's on an engine with heat this time. The heater has been broken on his last two trains. It should reach a high of 23 with a milder low of 16. I still want to attempt Cowtown, too. EEK!